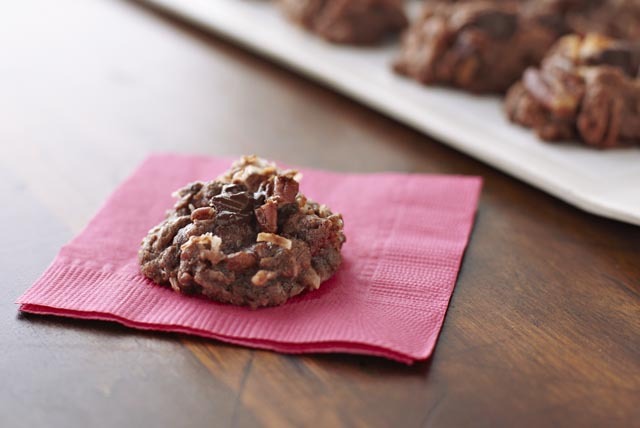 A cookie lover's dream: Homemade, chewy chocolate cookies with chunks of chocolate, coconut and toasted pecans. Chop 4 oz. chocolate; melt remaining chocolate as directed on package. Mix flour, baking powder and salt in medium bowl. Beat butter and sugar in large bowl with mixer until light and fluffy. Add egg and vanilla; mix well. Blend in melted chocolate. Gradually add flour mixture, beating well after each addition. Stir in chopped chocolate, coconut and nuts. Bake 10 min. or until cookies are puffed and feel set to the touch. Cool on baking sheets 1 min. Remove to wire racks; cool completely. Spread coconut in shallow pan. Bake at 350°F for 7 to 12 min. or until lightly browned, stirring frequently.